Other Names: Boenca or Boyenca (Guinea-Bissau), Fouta Jallon, Fouta Longhorn, Fouta Malinke, Futa, Malinke, Mandingo (Liberia), N'Dama Petite (Senegal). Incorrect names that are sometimes used: Dama and Ndama. 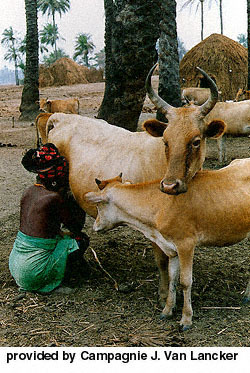 The N'Dama breed is the most representative "Bos Taurus" breed in West Africa. The origin of this breed is located in the Fouta-Djallon highlands of Guinea (Conakry). From there the N'Dama has spread in the sudanian and guinean regions. 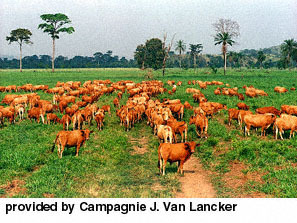 , it has been used for large scale dissemination for grazing savannah in Congo, Central Africa, Gabon, Nigeria and Zaire, especially in the regions infested by the tse-tse fly. The N'Dama is a hardy breed, medium size type (100 cm at shoulder height for cows; 120 cm for bulls) with a large and strong head and with lyre-shaped horns. Its skin,with short and thin hair, is fawn colored but varies from sand to black color, sometimes spotted. 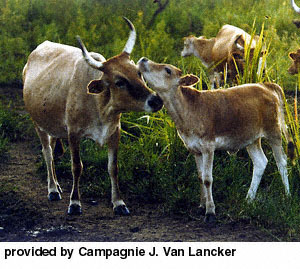 Cows produce only 2 to 3 liters milk per day during 7 to 8 months. The N'Dama breed is used for meat and the ratio carcass/liveweight is around 50%. The meat has a very good flavor without much fat. Average liveweight for a mature steer varies between 250 to 300 kg. In West Africa, to date there are approximately 7 million head of N'Dama. For the last 65 years, this breed has been developed in Zaire, where large scale herds have been improved by permanent selection practices by a private company named "Compagnie J. VAN LANCKEIC' which owns over 40,000 head of purebred N'Dama. This company has managed to increase, by selection, the average liveweight by 30 to 50kg without reducing the breed hardiness. This company is collaborating with the I.L.R.I. (International Livestock Research Institute) for an improved genetical analysis and selection of this breed.